This is a sponsored post written by me on behalf of DoubleDown Casino for IZEA. All opinions are 100% mine. Life can be stressful trying to make room for work, family, other obligations and fun. If you’re feeling the pressure, check out these 5 ways to de-stress in 5 minutes. Being a self-proclaimed worry-wart, I know how stressful life can be. It can be tough trying to juggle work, family, bills, other obligations and still having time to enjoy your own passions in life. Many times, before I even realize it, I’m stressing over certain things so much it starts affecting my focus and ability to get work and other chores done the way I want them. It’s just not worth it to stress out so much, though. So, I’ve been working really hard on stressing less and enjoying life more. Check out these 5 ways to de-stress in 5 minutes that I’ve been implementing with great results. 1. Take a few minutes to meditate or do breathing exercises. When I’m super stressed, I find it SO hard to concentrate on what I need to get done. Luckily, taking even just 5 minutes to meditate or doing a breathing exercise really helps me to clear my mind so I can do what I need to do. When I stress, I tend to be extra anxious as well, so I really like to do Dr. Weil’s 4-7-8 breathing exercise. It’s amazing how much it really does help calm me down! 2. Vent to a friend or write it down. When stressed, you might have let a range of emotions build up inside. Sometimes to feel better all you need to do is vent to a friend for a few minutes. If everyone is busy at work, I find writing down a small journal entry also helps me to get out whatever is stressing me out so I can get on with my day. 3. Listen to calming music. It’s amazing how much of an effect music can have on us. Listening to upbeat music throughout the day helps me get a lot more work done. On the other hand, listening to a song or 2 that I find really calming can help clear my mind and help stress melt away. 4. Take a short walk outside. I often wish I had more time to spend outdoors. There’s just something so calming and refreshing about going outside and breathing in some fresh air and soaking up a bit of sun. Going for a short walk outside, even if just 5 minutes, almost always helps me de-stress. 5. Play a quick game. Sometimes when I’m stressed, I just need a fun distraction for a bit. I love that with today’s technology, there are a variety of games and apps constantly at our fingertips on both our computers and mobile devices. One of my recent favorite online games has been DoubleDown Casino as it’s such a fun way to play the casino games we all love while escaping our daily stressful routine for just a few minutes. Plus, it’s pretty awesome to get an authentic Vegas experience from the comfort of your home or wherever you may be since you can play on your computer, phone or tablet. 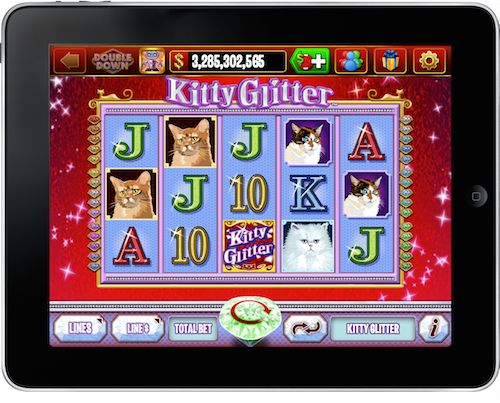 Since the casino games are free to play, you can play stress-free and enjoy that giddy feeling when you win, while shrugging it off your shoulders when you lose. 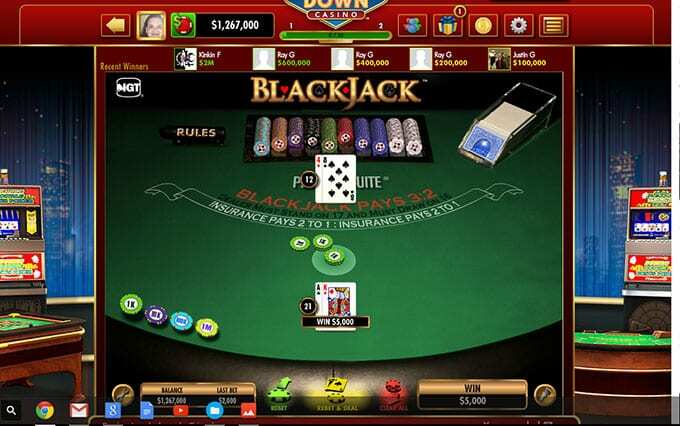 Slots are the most popular casino game DoubleDown casino offers, but I’ve always been a huge fan of Blackjack myself. It was super easy to create my account and get started. After just a minute I was playing and trying to get that perfect 21! After just a few minutes of playing, I had forgotten about whatever I was stressing over and was able to enjoy the rest of my day instead of being a worry-wart. Head on over to DoubleDown Casino to play now and follow them on Facebook, too! 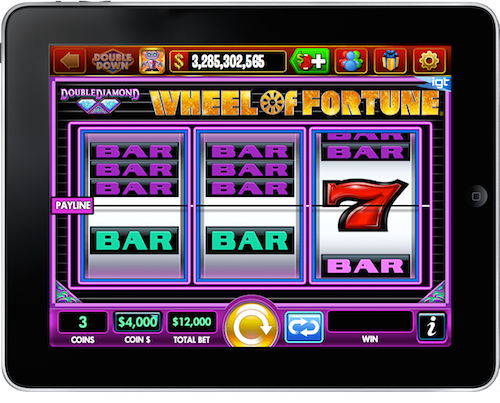 What’s your favorite casino game on DoubleDown Casino? What are some of the ways you de-stress in 5 minutes? Great tips, I always do the venting to a friend one as it always really helps. I havent thought of playing games as a stress relief option before- but I can see how that might work! These are fabulous tips. I love to diffuse lavender essential oil to creating a calming environment at home… And one of my favorite ways to destress in a cinch is to do some sort of physical activity: 5 push ups or a set of planks… Nothing that is going to get me to break out into a sweat but enough to get my blood flowing and give me a clean boost of energy. I like to listen to music to relax and sometimes to take a bath. I’ve also been venting to friends a few times this week. I like to vent or write down my frustrations! These are some great ideas to help relax, thank you! I like to take a walk.. I sit at a desk all day long so it feels good to get up and move! I need de-stress tips, thank you ! Write it down tends to work well for me when it comes to destressing. I’ll have to try out some of these other options!